Timberline Lodge is just over an hour drive from Portland depending on traffic and weather conditions. Timberline strongly urges you to travel safely, be prepared for inclement weather, and use caution when driving in winter weather. Check below for all of your transportation options, winter weather driving information, and parking information for your next visit up to see us. The Timberline Resort Shuttle operates on weekends and holidays through March 31st, with service between Government Camp and Timberline Lodge. Riding the shuttle is free for Timberline and Fusion season pass holders and Timberline online lift ticket holders. The shuttle offers continuous circulation - we anticipate one lap hourly but recognize factors such as road and crowd conditions will influence timing. There is currently one stop in Government Camp at Summit Ski Area and then up to the Crescent at Timberline's Wy'East Day Lodge. The first pickup is at 9am at Summit Skit Area. The last pickup is at 4:30pm at the Crescent at the Day Lodge. From bus service along Highway 26 to ridesharing from Portland to booking a private bus for a large group, there are many different ways to get to Timberline—both in summer and winter—that don’t involve driving yourself. We’ve compiled a list of operations we know and trust. As always, please don’t hesitate to contact us if you need any other information or suggestions. You’ll be guided through the steps. As you enter your route information, Timberline Lodge will appear in your End Address List. If you get stuck, click “Local Support” tab for help. Ski trips are a blast! But who wants to drive both ways there and back? Let Aspen Limos & Tours shuttle you in one of their executive vans or 4×4 party buses. Aspen Limo & Tours has provided Mt Hood Shuttle service for many years and their drivers are experienced with mountain driving. Aspen Limo & Tours is USDOT compliant, Portland permitted, airport approved, and registered in both Washington and Oregon. Visit www.aspenlimotours.com or call 503-274-9505 for reservations. Consider transit: Visit Mt Hood Express to learn about park and rides and schedules. Dress for the weather: Dress in warm layers and limit exposed skin. Drive for the conditions of the road: Adjust your speed to the road conditions. Use chains and traction tires: When chains are required, use the next chain up area to put on your tire chains. Do not stop in highway to put on chains. Chain up areas and highway shoulders are not for recreation. Don’t park your vehicle along the highway: abandoned or parked vehicles along the highway will be towed. Consider your travel time: Mountain passes see the highest number of vehicles during the winter break and on weekends. Know Before You Go: Visit TripCheck or calling 511. Here is a video about how TripCheck can help you. 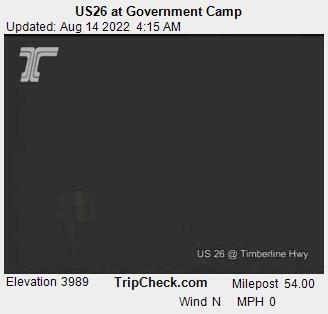 Timberline Lodge is just a little over an hour from Portland depending on traffic and weather conditions. Timberline urges you to travel safely, be prepared, and use caution when driving in winter weather. Check below for all of your transportation options, winter weather driving information, and the Google Map to Timberline. Pass through the towns of Sandy, Welches, and Government Camp. There are three parking lots at Timberline Lodge. Up by the main lodge, the lot is reserved for hotel guests. The two lower lots (Main Lot and Salmon River Lot) are for day visitors and employees. During the busy winter season on weekends, our parking lots fill up quickly with ski area guests. We recommend carpooling and arriving early or taking advantage of the Timberline Resort Shuttle (see above). 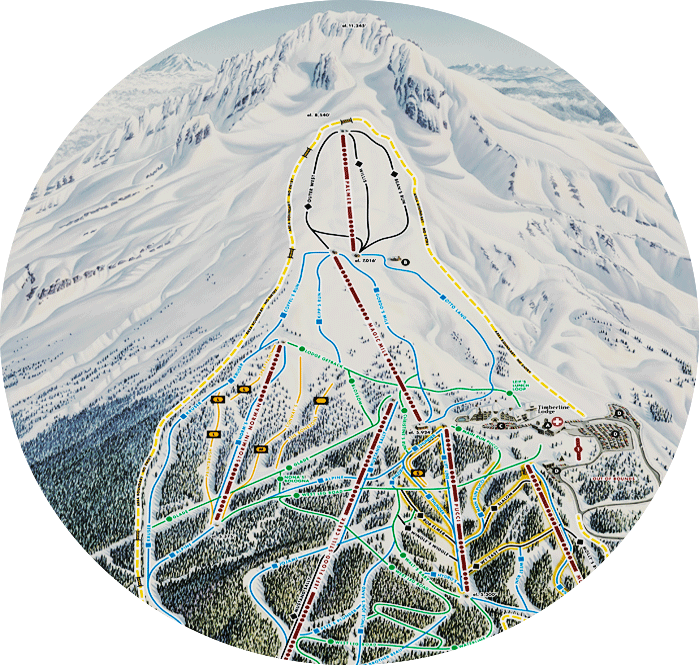 If you’re driving your own vehicle to Timberline, remember that Sno-Park Permits are required for all state-maintained parking areas in recreational areas November 1 – April 30. The funds raised by these sales supplement the snow removal budgets for these areas. 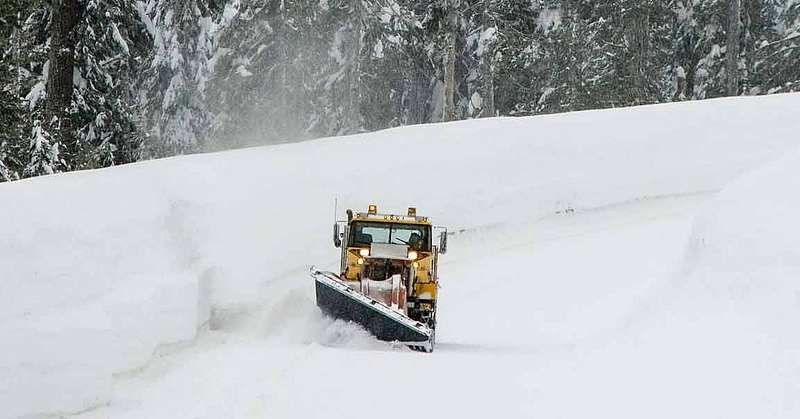 All Timberline parking is maintained by the state, and therefore requires Sno-Park Permits. They are available for 1 day, 3 days, and for a full season. Day visitors during the winter season can purchase Sno-Park Permits at any open ticket window or inside the Wy’East Day Lodge at the Guest Services Desk. They are also available at many local businesses on the way to the mountain.